The Held Spot glove is a short cuff, HIGHLY armored street glove. 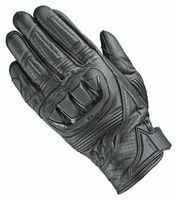 To get the feel for this one, picture a full-on race glove with molded knuckle protection, Kevlar reinforcement on the back of the hand, Kangaroo palms, and substantial palm slider…. then subtract the gauntlet, and that is the Spot glove. Held’s Sambia glove has been a very good seller for over five years now, and the Spot is similar in that it is a short cuff design, but the Spot is a solid leather glove with a big knuckle venting capability where the Sambia is a bit “lighter” in construction with the use of some mesh and also perforated leather on the palms. The Spot is a full solid leather chassis like you see on most race gloves. One feature that will be useful for street riding is the built in visor wiper (although I wouldn’t recommend this glove for repeated use in rain).